A guide to all things parchment craft: Including book reviews, equipment and other useful information. 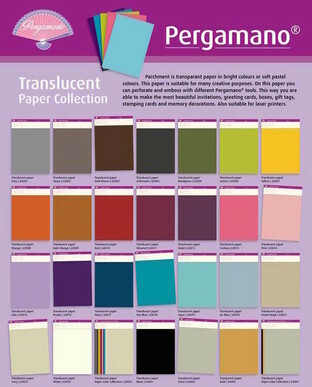 Pergamano have introduced a new collection of paper for parchment craft, there are 23 colours all A4 size and 150g. The colour range is interesting there are more neutral shades and less pinks and reds, however there are also colours like dark orange and anthracite which are very appealing. The regular 150g plain parchment paper remains the same. The side on which the colour has been laid down is much rougher than the older ‘Fantasy’ (Parchment Paper) sheets. There is definitely a ‘right’ side to emboss with this paper. Above are a sample of embossing on different sides of the paper. I have embossed lines,circles, dots, writing and used the extra large ball tool just underneath the writing. It is clear that only one side (the right hand side) works. 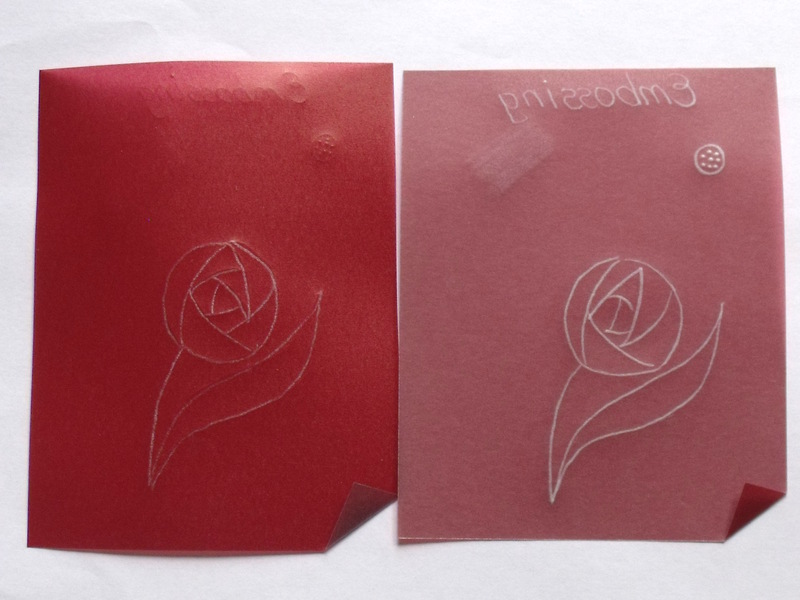 The embossing results are very similar to the current 150g coloured parchment paper. Which side to emboss? I suggest you test a corner with a simple dot before you start and you will soon discover the right side. Don’t forget that you can use the Dorsing technique to colour regular parchment to a shade of your choice with Dorso Crayons or Oil Pastels. I would like to thank Mary Price for testing the new translucent paper and providing her review of the product which has greatly helped me compile this blog.